Jo Zanders (1975°) found his first snaredrum in the attic of his grandfather. He began imitating traditional gun corps, which eventually led to a great passion for mobile drum groups. During his studies in social and cultural anthropology at the K.U. Leuven he met Luc Mishalle and became a member of Al Harmoniah. In 2000, he founded the group “Fanfarrah” together with Mishalle and Michael Weilacher for the first edition of the Brussels Zinneke parade. The Fanfakids, who are still very active, arose in the wake of this. These projects formed the beginning of his course: (mostly) mobile percussion groups, self-built instruments & original grooves with the street as a stage. Besides his work for de Krijtkring (which became MetX after a while) with Saxafabra, Bagadski and VelotroniX, he is active in the Folkscène with a.o. Göze, KV Express and Dazibao and he plays for a young audience with Zannemie & De gang. 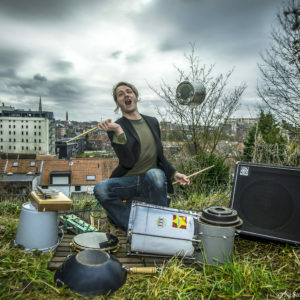 He’s mainly active in his home base Leuven where he’s the driving force behind De Batterij: a one-man organization in which various percussion projects (DROM, LKMTiV, FabostatiX) and an instrument atelier are accommodated.